Today was the first day of Open Studio at the Digital Art Academy. Time to give my shiny new brushes a try. I dubbed them Eastern Water in deference to sumi-e style paintings. I wish I could tell you that I successfully culled them, but strangely the numbers increased to a colossal number, 42, which has cult status and is the answer to the ultimate question of life, the universe, and everything. 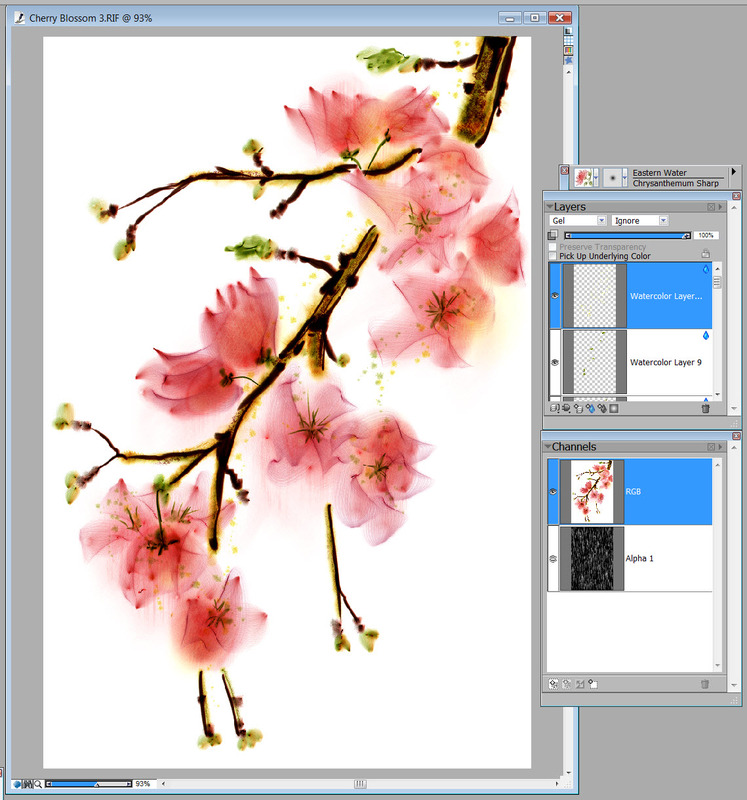 Armed with the answer to everything, I began to paint the assignment, cherry blossoms. My first attempt was rather stiff, as was my second, third, fourth and fifth. Then I had an “aha” moment. I noticed the weeping cherry in full bloom outside my window. Duh, it is much easier to paint when you have the real thing as your reference. I cut a branch and brought it inside. Have you ever tried to put weeping cherry in a vase. I’m sure florist know how to do it, but my little weepy branch kept falling out. I finally propped it and vase in a vertical position, which meant the flowers were upside down. I found a workaround. I painted a little; extracted the branch from the vase and observed the flowers in their normal position, and then returned them to the vertical. Hey, the answer to everything is pretty handy. Alpha channels are pretty handy in Painter, too. Alpha channels are defined as a storage device for selections, but I think of them as super selectors. To start this painting, I first created an alpha channel. My intent is not to make a tutorial about this painting, but simply show the workflow through a series of screen shots. This is the alpha channel after painting it with short vertical strokes. When a selection is created the black areas will be protected and the lighter areas are available for paint, which is just the opposite of a layer mask. I added a watercolor layer. 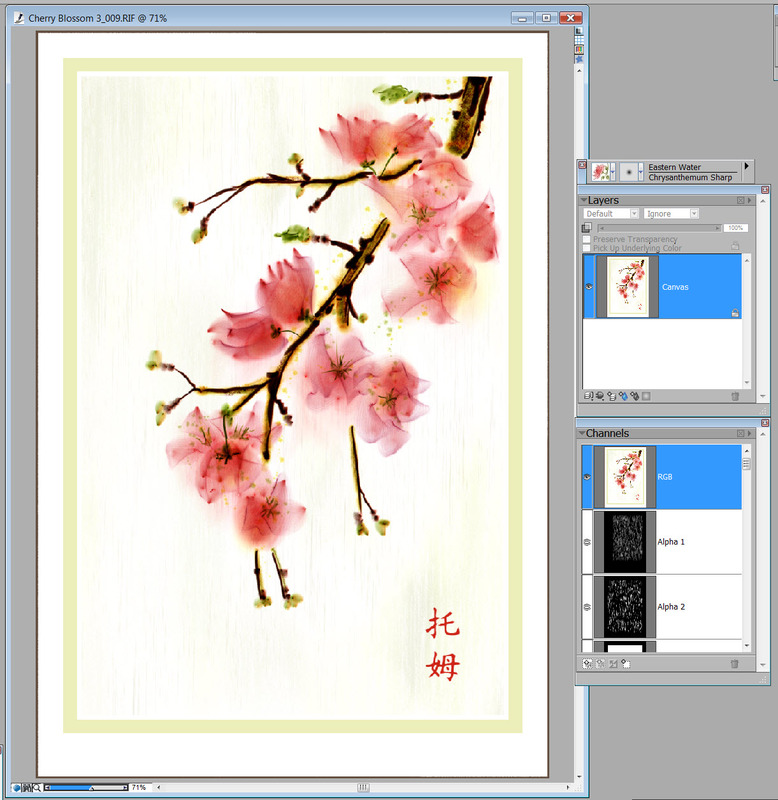 Using my Textured Fill Wet variant I lightly and softly identified the areas where the blossoms would be. Added an additional watercolor layer; I work with a lot of layers. I used my Chrysanthemum Sharp variant to give some form to the flowers. I inadvertently continued painting on this layer with Iris Blade, but I wanted to be on another layer. I deleted what I could. Giving some form to the flowers. 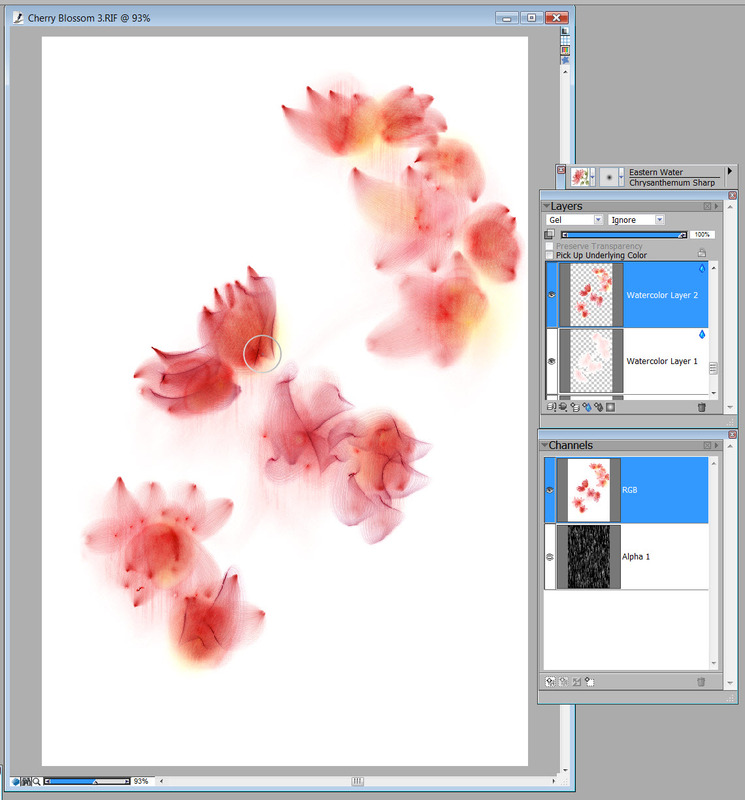 On the third watercolor layer I used Iris Blade to give a soft overlay that looks like a petal. The center of the flowers and the branch was painted on layers 4, 5, and 6. I used several brushes, Chrysanthemum Sharp, Bamboo Texture Sharp, Thistle, and Plum Anther. 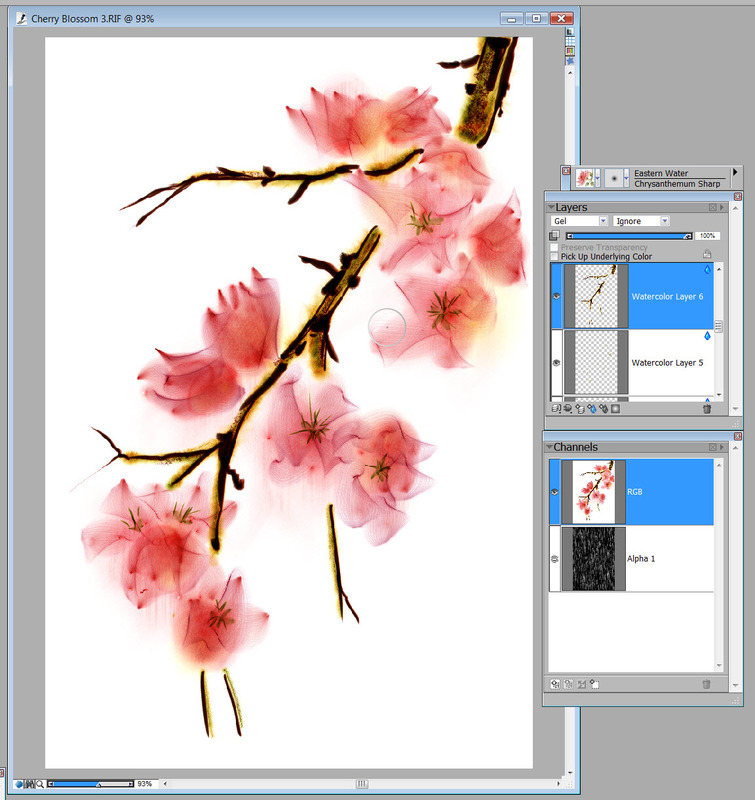 Added flower details and the branch in the next three layers. Layers 7 to 10 finished the details of the painting, buds and the first early leaves just barely showing. At this point I did an Iterative Save and then dropped all layers. Added green buds and leaves just beginning to open. I didn’t like the composition and added some canvas to the left and bottom of the image. Also added my name in Chinese characters, at least I think that is what it is. I got it from one of those sites that claims to write your name in Chinese; it could be profanity for all I know. 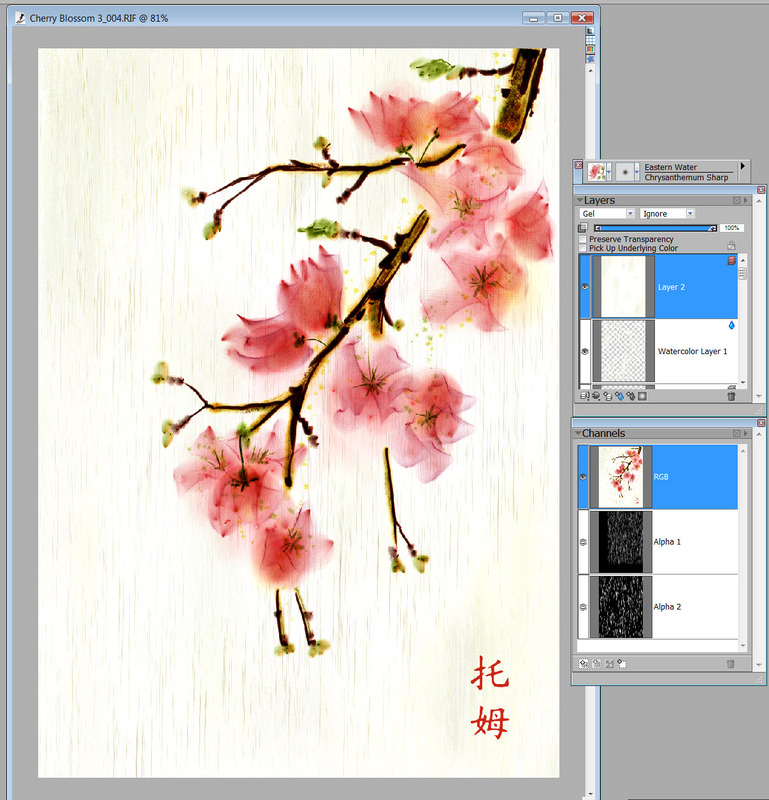 Improved composition by adding area to the left and bottom of the canvas, and added my signature in Chinese characters. 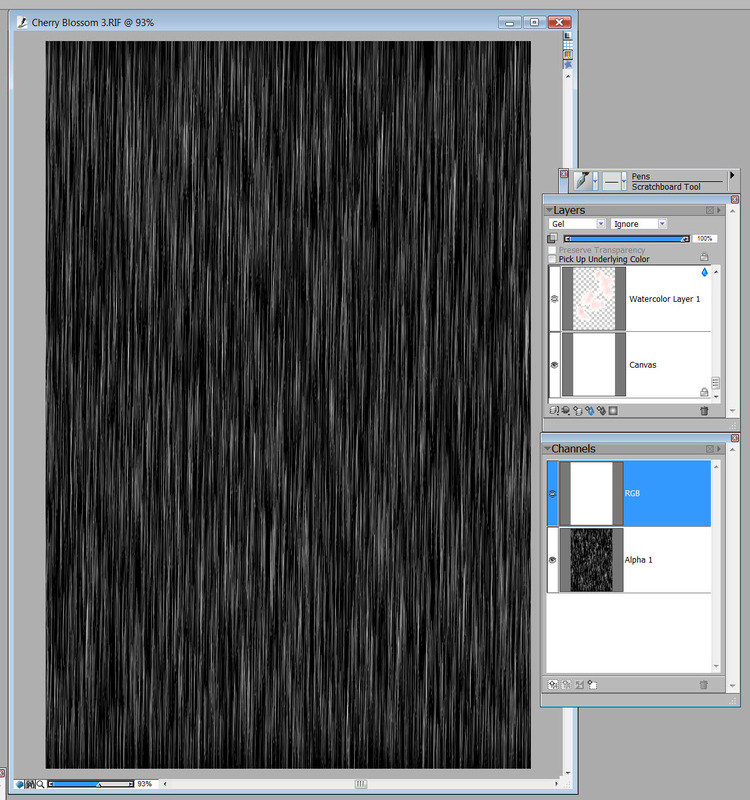 When I increased the size of the canvas, the alpha channel did not have any texture in the extra area. I created a new alpha channel that was the correct size and with the same style texture. I loaded the selection from this channel and in two layers painted the background. I reduced the opacity of the layers for the finished piece, but in this screen shot I left the background at 100% opacity so you can see the texture. Added texture from alpha channel selection. In the final piece, the texture will be reduced in opacity greatly. I added a frame to finish the work. I hope you enjoyed this quick look at the workflow of this painting. Here is the zip file of the Eastern Water Brushes. 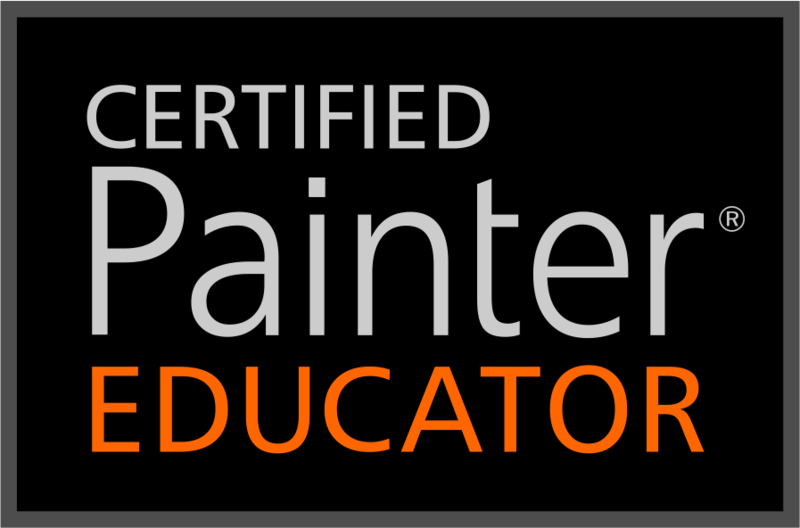 They are compatible with Painter IX, X, and 11, thanks to Brush Master David Gell, who has created a script to automatically adjust the brushes for backward compatibility. The brushes can be installed using the Studio Chris Brush Manager. Zip file will be added later; I can’t figure out how to add it now. I am so excited. Open Studio starts next Saturday at Digital Art Academy. We are going to study sumi-e painting, which is one of my favorite art forms. To get ready, I started researching sumi-e by watching You Tube “how to” videos and trying it myself in Painter 11. Guess what? It “ain’t” so easy, at least not digitally. 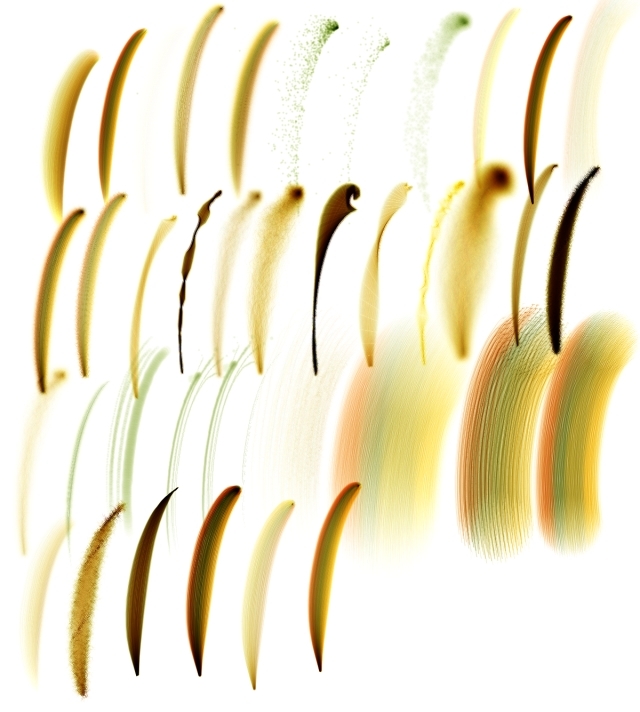 To make life simpler, I decided to create some brushes that I thought would make the process easier. Did I just write that? Anybody got any whiteout? Simple, easy, and brush creation do not belong in the same paragraph. Brush creation can be frustrating, and it can be satisfying. In Painter 11, there are a seemingly infinite number of controls, yet the one tweak that I need to make the perfect brush is just out of reach, so frustrating. However in the search for the ideal brush for sumi-e, many flawless brushes for different styles develop, which can be very satisfying. Many does not describe the actual reproduction phenomenon. Brushes ripen in numbers equal to the spore of a mushroom. In case you don’t know, that’s a whole bunch. So, I need to cull and name. Have you ever tried to name a brush. Think about it. It has a stick and some bristles. What do you name something like that? If you think about it, digital brushes have neither stick nor bristles, but are pretend brushes. The difference between digital and traditional will have to wait until another day, besides, the function of the brush is most important. I like the name of the brush to reflect its function, but that isn’t always so easy. In this current set, I made a brush I called curly leaf because it made a curly leaf. But then I proceeded to make 11 variations of that brush, each called curly leaf followed by a number; curly leaf 1, 2, 3, etc. I know, it is not very original, but in the heat of tweaking, naming is not a high priority. Tweaking is over; naming and culling are hot. In my last set, I had descriptive names like rouge, powder, lipstick, and I have a mind to continue descriptive names with this set. If I do, there will be names like Iris Blade, Carnation Splash, and Thistle Prickles. I wonder if I have the first signs of dementia. Okay, so I am naming and culling; luckily, I have experience. I used to raise fancy goldfish. Some babies got named and some got eaten by the Red Oscars. Naming and culling can be brutal. Mistakes will be made. Here is a sample page of the brushes that have made the first cut, but are yet to be named and still in danger of being culled. Notice how similar they look at first glance. So, how do I decide who makes the grade. For me it is through application. 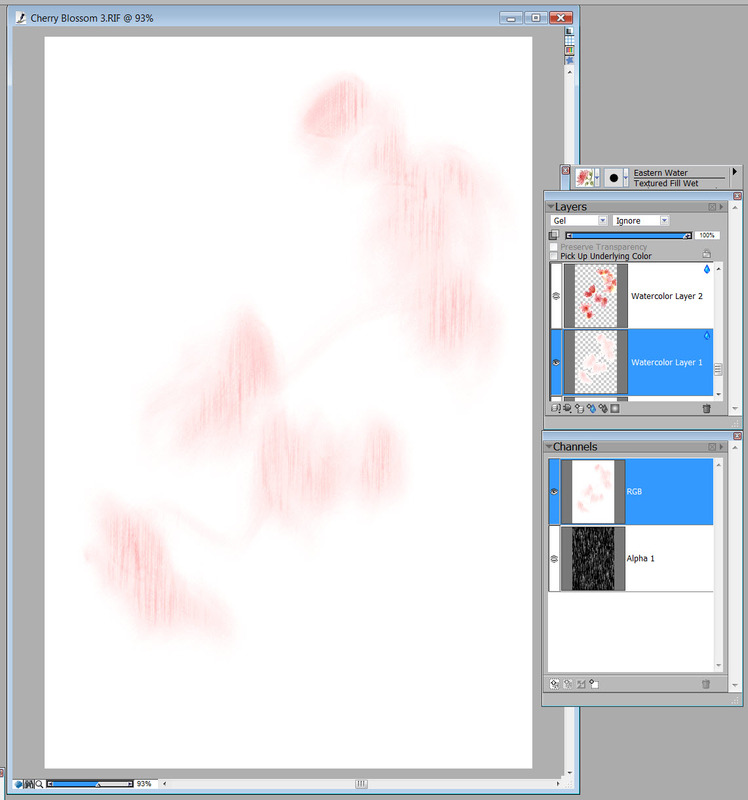 Normally, I don’t start creating a set of brushes without some idea of their function. In this case, I’m interested in sumi-e. I need brushes that can help me create the essence of a form, without giving too many details. Want to see some brushes in action. Check out this video. In another post, I’ll talk about tweaking brushes, but today, all I can think about is culling, naming and getting ready for Open Studio. I’m perplexed. I am writing my first blog entry for a class I am taking at LVS called Basic Blogging, or is it Blogging Basics; could be neither. The name might be Writing 101, but who cares; it is essentially an exercise in writing, which is not my strong point. I much prefer talking. I love the spontaneity of a chat. No problems worrying about how to start with a chat. Hi works almost every time. Yes, I’m perplexed. How do you start writing a blog? Should I express my feelings of concern as I am doing now, or…or what. Or what; that is a big subject. Think Skippy, what is this blog about anyway? What did you decide for a subject; who is your target audience; what is your authority? I don’t care. I know we discussed those things, and I posted my intent, but those were just words. What I am feeling now is complete fear. Fear of failure; fear of inadequacy, fear of looking foolish are all popping into my mind. Plus, I still don’t know how to start this darn blog. Wait. What is this I see? Three paragraphs proceeding this one. Oh my, I have started blogging! Easy as pie! I’m a natural. No sweat. Just sit down and begin writing. This is so cool. Hold on Skippy. What about the subject of your blog? Remember, I think you were going to discuss Painter. Leave me alone. I’m on a roll; words are flying from my fingers. I feel like I am having a chat. Ha, I guess I am having a chat with you. Who are you anyway? Does that matter? Let me ask you a question. How are you going to end this post? End this post? I don’t know; it would be easy if I were having a chat. I would just say goodbye and walk along. Oh gosh, I’m perplexed. I am writing my first blog entry for a class I am taking at LVS called Basic Blogging, or is it Blogging Basics; could be neither, and I don’t know how to end the post.